Gingrich was one of those people to whom words come easily, which is just as well, since he was the founding editor of Esquire and the magazine would have done badly without him. 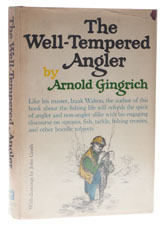 He wrote several books on fishing, The Joys of Trout and The Fishing in Print being well worth a read, but this one is his best. "On its inaugural trip, there were just three of us fishing aboard the Pilar, because the fourth, who was supposed to be F. Scott Fitzgerald, had refused to come, saying: "I can't face Ernest again, when he's so successful and I'm such a failure." The third man in the boat was John dos Passos, who was even less of a fisherman than Scott Fitzgerald, but mixed a mean drink which he called a Gulf Stream Special. As I remember it, it was a poor country cousin to a Pimm's Cup. Dos Passos mixed it in a zinc pail, to which he gave full marks for its contribution to the mixture's peculiar pungency. The gin gave out at Dry Tortugas, where there were no facilities to acquire any more, so a search of the boat uncovered a case of John Jameson's Irish Whisky up in the bow, which somebody had thoughtfully put aboard as a christening present to the Pilar. It was over the Irish, that evening, that Ernest confided to Dos Passos and me his high opinion of Gary Cooper as Lieutenant Henry in the screen version of A Farewell to Arms, and his correspondingly low opinion of Helen Hayes as the choice to portray Catherine Barkley." Not so many people got to fish with Ernest Hemingway. Fewer still got to write about it. A classic.